Hello, PMB friends! 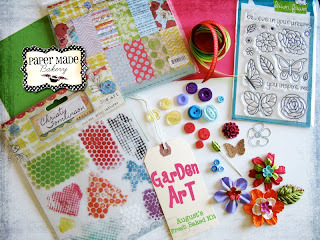 The August release of Garden Art Kit is in full swing. 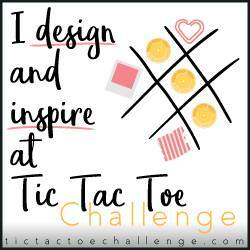 If you would like to participate in the blog hop and giveaway, you have until midnight on Friday, just start here. The colors in this month's kit are so beautiful and vibrant, that it make it so easy to design a project. In fact, I've completed six projects already. Come back all month long to see a new reveal each day from the entire design team. I wanted a way to highlight all the bold colors and patterns from Christy Tomlinson's designs, so I went with multiple strips of patterned papers. I distressed the edges with black ink to give it a slight border which really made the colors pop on the white cardstock. Since I wanted to keep this a blank card, I added a row of punched hearts in the middle of the stripes so the sentiment is implied instead of stated. This way, I can have a card ready for any occasion. 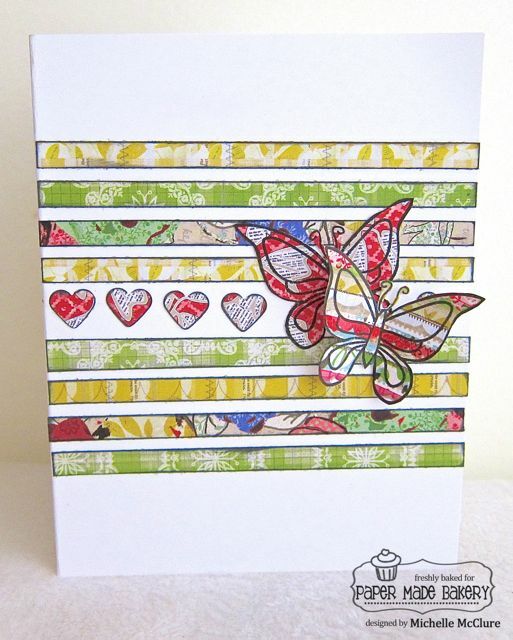 I stamped two butterflies onto the patterned papers and cut them out. I adhered one flat onto the card, and the other I only adhered the middle down onto the card. I folded the wings up for some added dimension. Thanks so much for fluttering by Paper Made Bakery today! 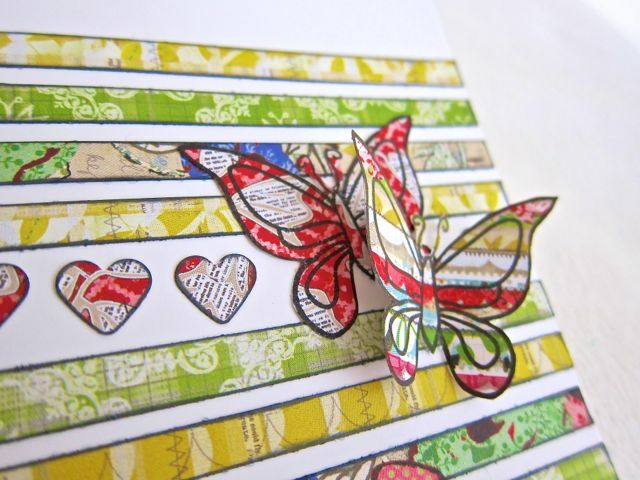 love the strips of paper teamed up with the paper pieced butterflies...gorgeous! This is GORGEOUS!! I love love love love the paper strips and loveeeeeeeeeeeee the butterflies!!! Great color combo. Will have to try this as I like CAS designs. Thanks for the inspiration and chance to win. Love the different strips of pp... very nice. What a delightful card creation! 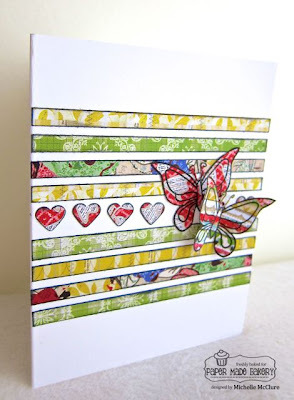 LOVE the strips of patterened paper, and how you distressed them and then those butterflies ... wow! GREAT creativity!! I've added this card to my pinterest board! Love it! This is gorgeous, Michelle! 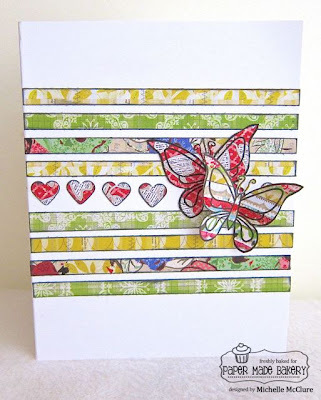 I love the strips and butteflies and the heart "sentiment" is inspired! Great job!! Fabulous card! LOVE the colors in the kit!!! Beautifully done! Have a wonderful weekend! He hearts look great using the same paper as the butterflies. This is so cute!